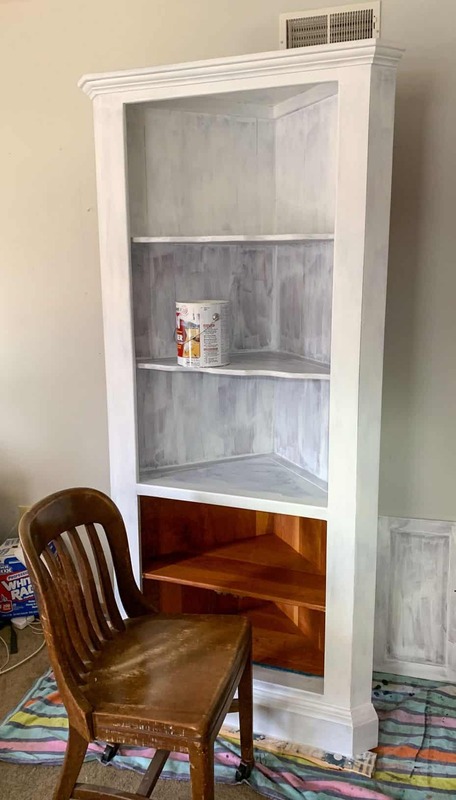 A few weeks ago, a friend of a regular customer of mine reached out to me to see if I’d be willing to paint a cherry corner cupboard for her. It was well-made and she loved the piece itself, but the current finish on it no longer coordinated with her home decor tastes. 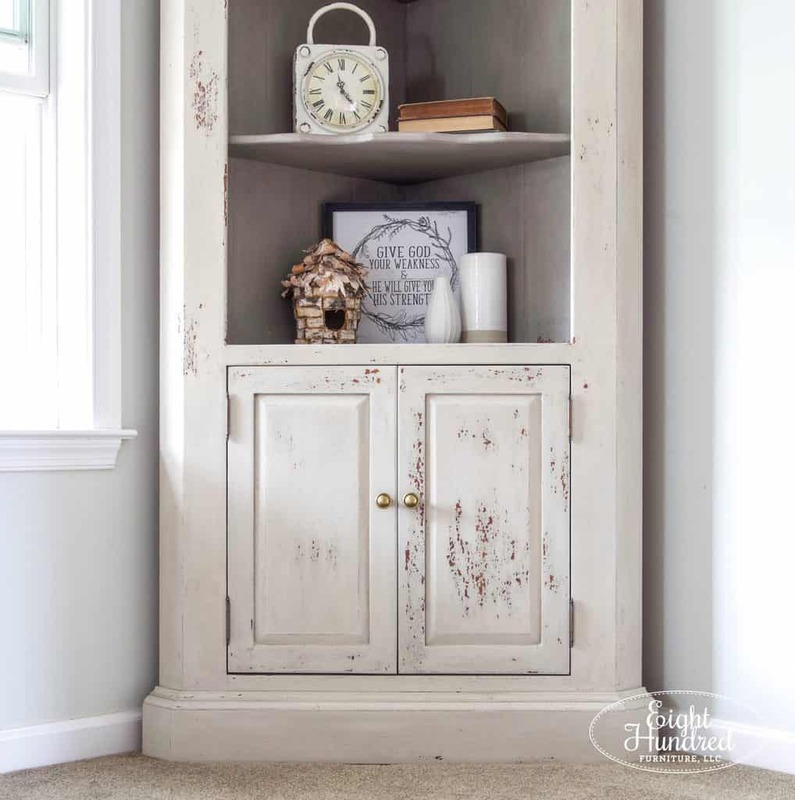 Using Marzipan and Schloss by Miss Mustard Seed’s Milk Paint, I took this corner cupboard out of the 1990’s and aged it about 100 years! 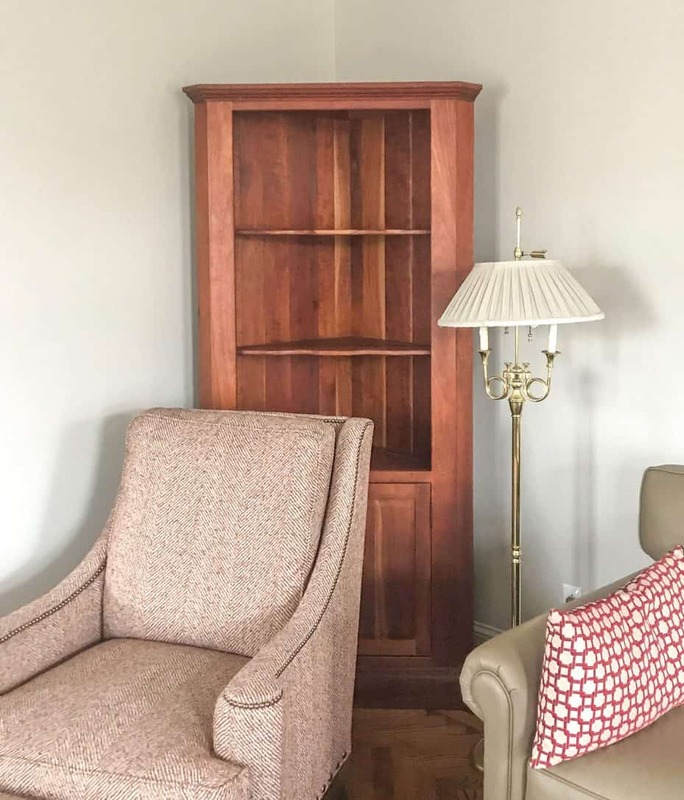 Whenever you are embarking on a furniture makeover, you should always exercise proper prep work. This involves cleaning, making structural repairs, removing hardware, taping off areas you don’t want to paint and (gasp) sanding. I know this practice has become almost taboo in the furniture painting world. There are some paint brands on the market that say prep work is not necessary when you use their product. I think this is nonsense. 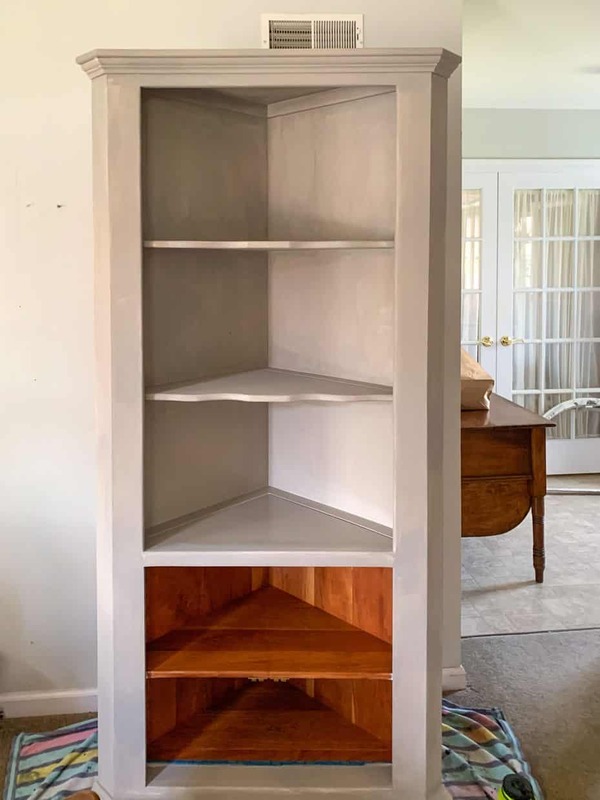 I know it sounds a bit harsh, but if you want to paint a piece of furniture that’s not brand new, you need to do the scut work up front to get it ready for paint. To prep this piece, I cleaned it with a 50/50 mix of denatured alcohol and water. I have a bunch pre-mixed in a spray bottle, so I sprayed the piece down and scrubbed it with a green Scotch-Brite pad. Once it was dry, I gave it a gentle scuff sanding with 400 grit sandpaper. After a good once-over with the vacuum, I began applying two coats of BIN Shellac Based White Tinted Primer. 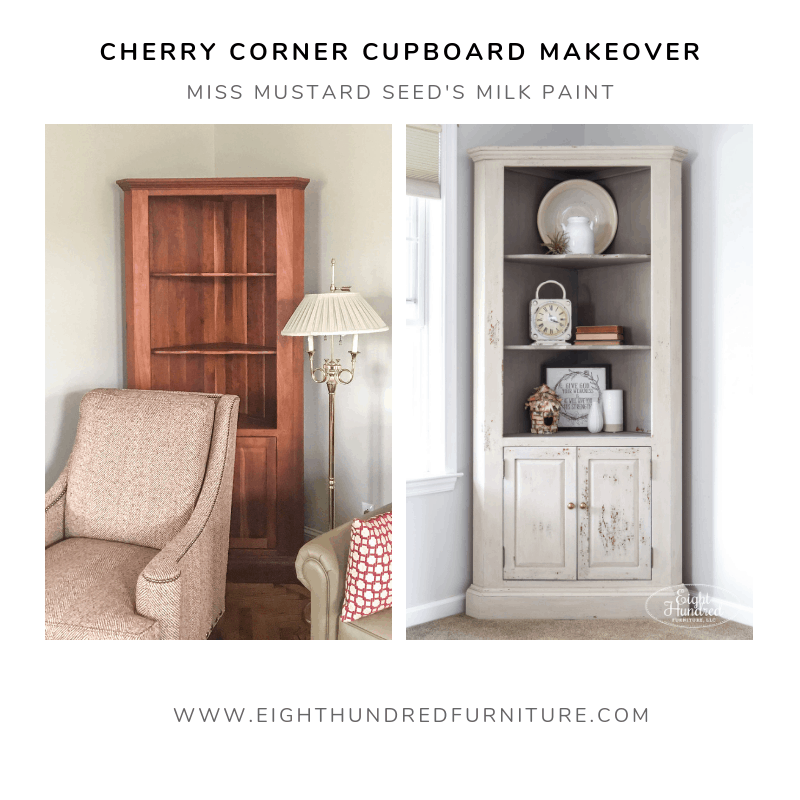 My customer wanted me to lighten up her corner cupboard using Schloss and Marzipan by Miss Mustard Seed’s Milk Paint. The existing finish on this piece was very red and orange. If I went over it right away with paint, it would almost certainly stain and bleed through. The primer’s job was to lock in all of the knots and cherry wood stain. 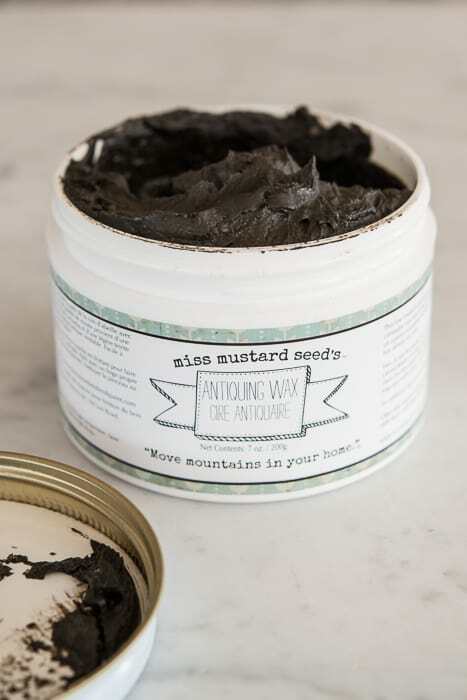 It would also help Miss Mustard Seed’s Milk Paint adhere to the surface. Primer always looks a bit scary when it goes on. Always apply 2 coats of primer, allowing plenty of dry time in between each one. 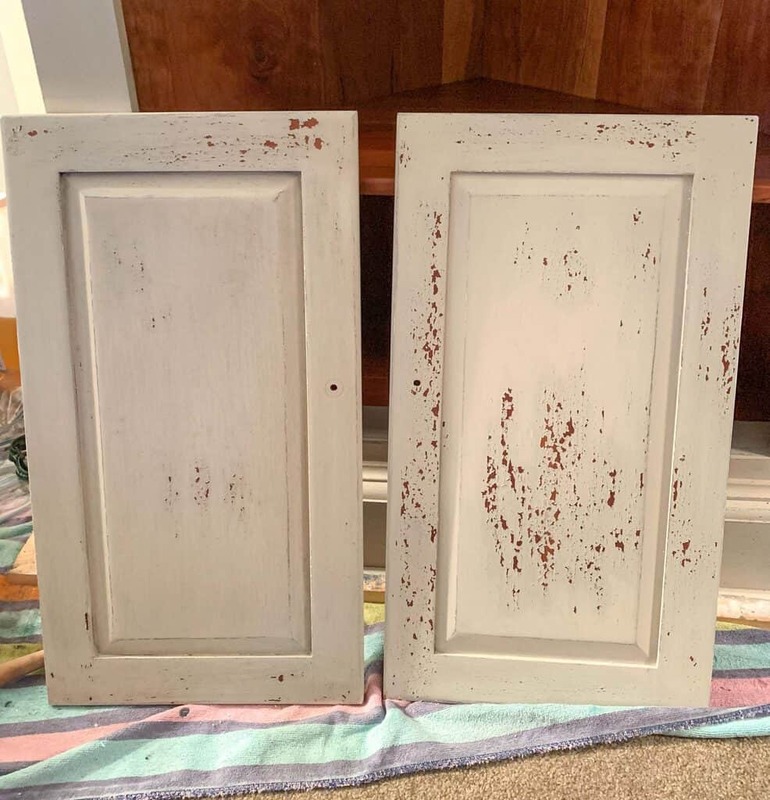 The first coat draws out any potential stains and the second coat locks them in! 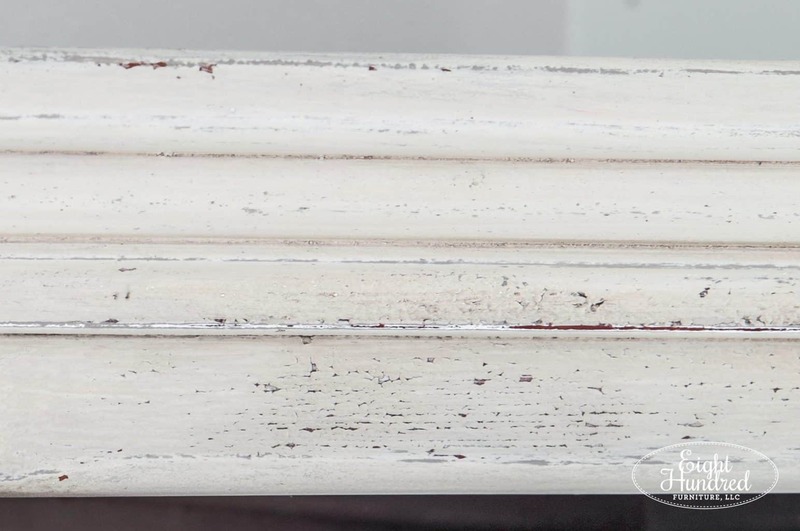 Once the two coats of primer were on, I began painting with Schloss by Miss Mustard Seed’s Milk Paint. 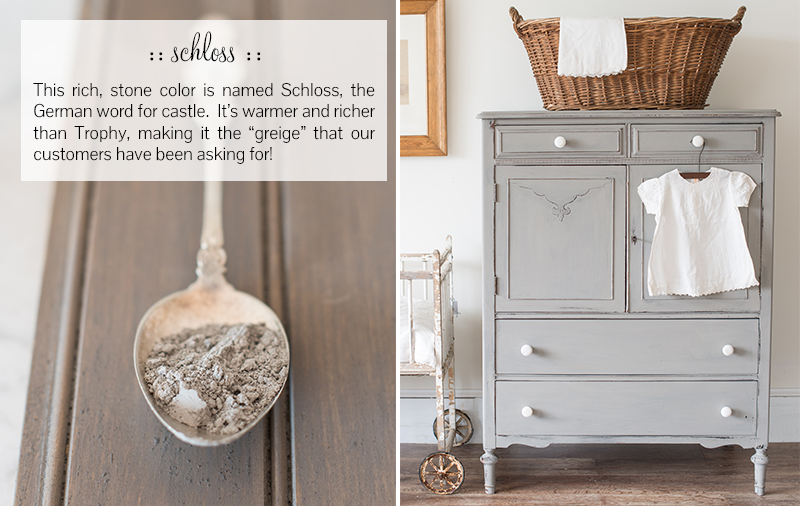 Schloss is a beautiful warm gray color and it’s absolutely dreamy to work with! Oddly enough, I got chipping in random spots. I have to admit – I was pretty surprised to see chipping on this piece. 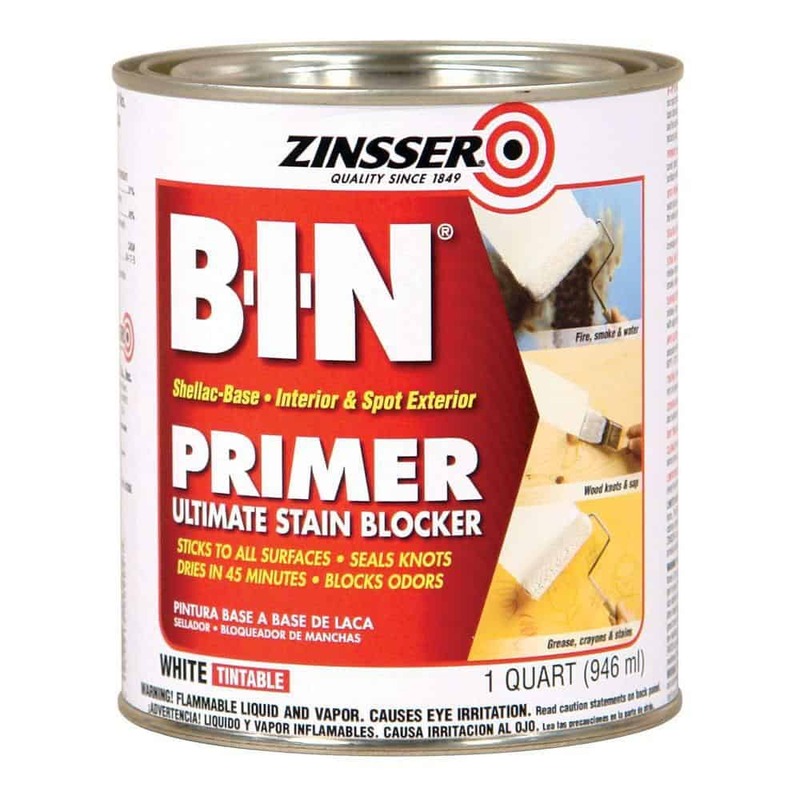 A good quality primer, like BIN, usually prevents this from happening. But here’s the thing with painting furniture – you have to be flexible. When furniture comes to you, it’s almost impossible to know what’s on the surface. 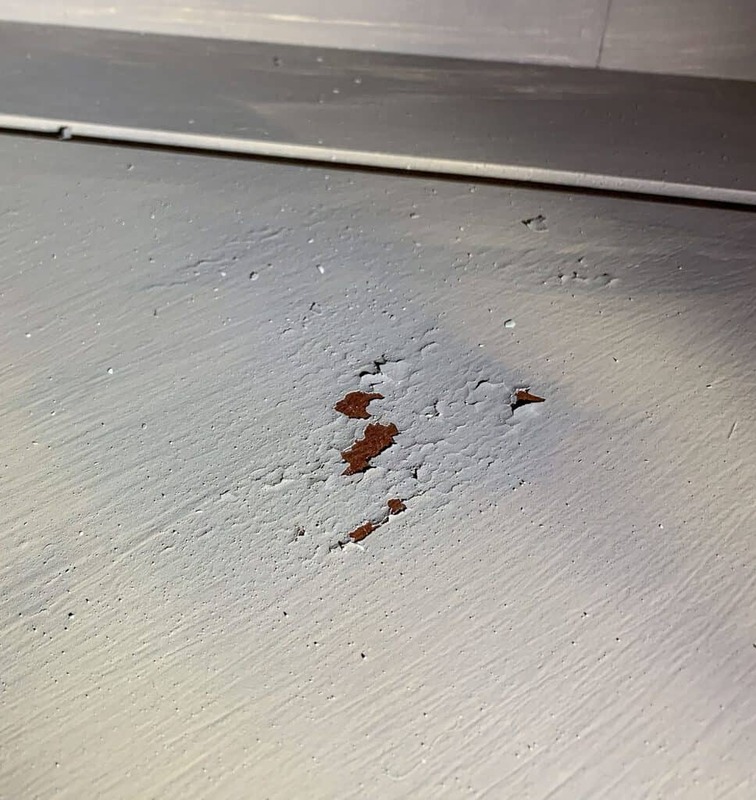 Who knows what kind of dust, dirt, grime, grease, oils, cleaning products, dusting sprays and other surface contaminants could be lurking on the surface? This is why you should ALWAYS prep clean and sand your piece before you begin painting. That process removes a good bit of these potential troublemakers. Sometimes there are surface contaminants that can’t be removed. Silicone is one of them and is found in dusting sprays like Swiffer. Pledge is another culprit that causes unwanted chipping on pieces. Pieces that were treated heavily with these types of polishes, oil soaps, cleaners and sprays will be difficult pieces to paint. That’s most likely what happened with this corner cupboard. Fortunately for me though, my client liked the chipping, as did I! I thought it gave the piece so much character and charm. Here’s the piece after 2 coats of Schloss. The next step was to rub a Wax Puck all over the outside of the corner cupboard to create a resist. 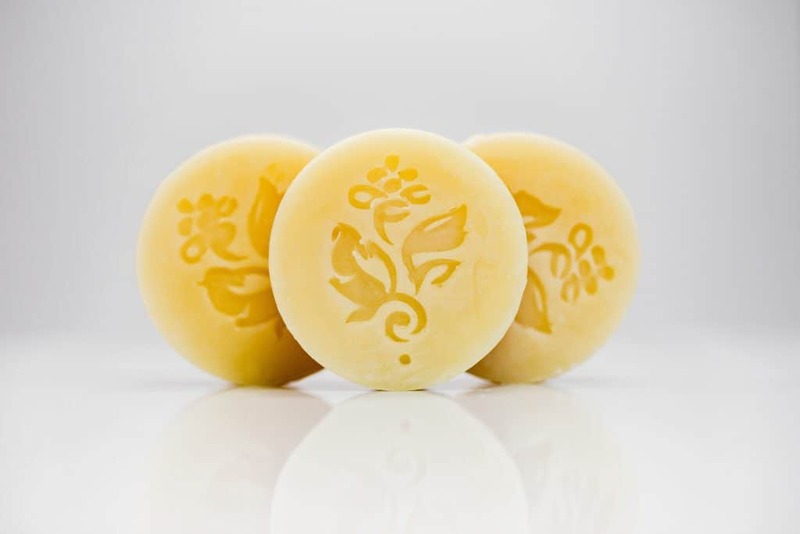 A Wax Puck is a disc made from 100% beeswax. It’s great for rubbing along edges to keep paint from sticking. It’s a great way to help with distressing too! Photo by Anna Alexander Photography for Eight Hundred Furniture, LLC. My customer wanted Marzipan painted over the Schloss, and gently distressed back to show bits of the gray here and there. The sample boards below show the look we developed together. 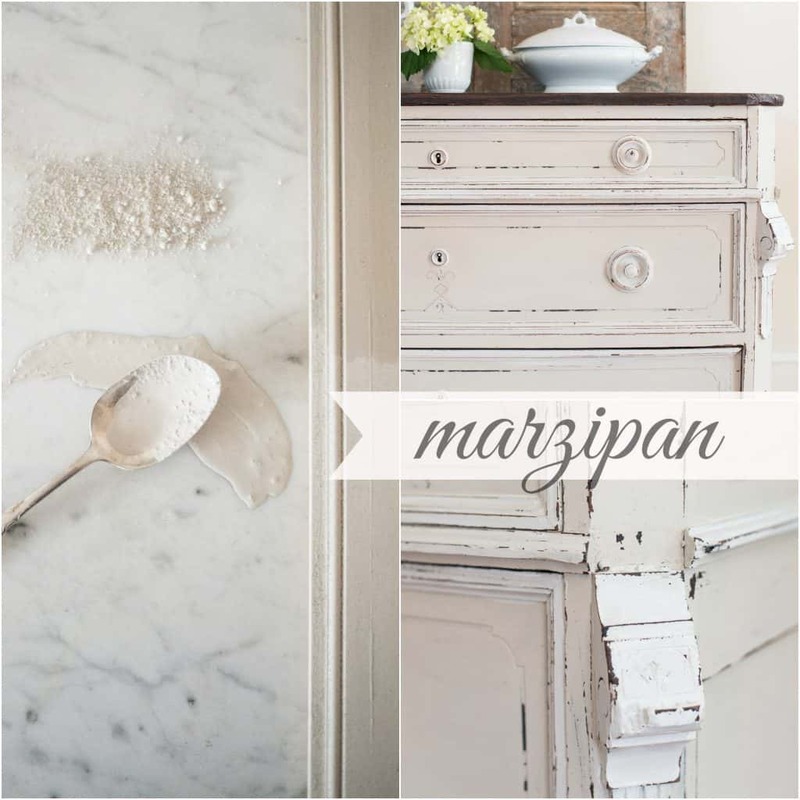 Marzipan is a lovely warm almond color from the Miss Mustard Seed’s Milk Paint line. 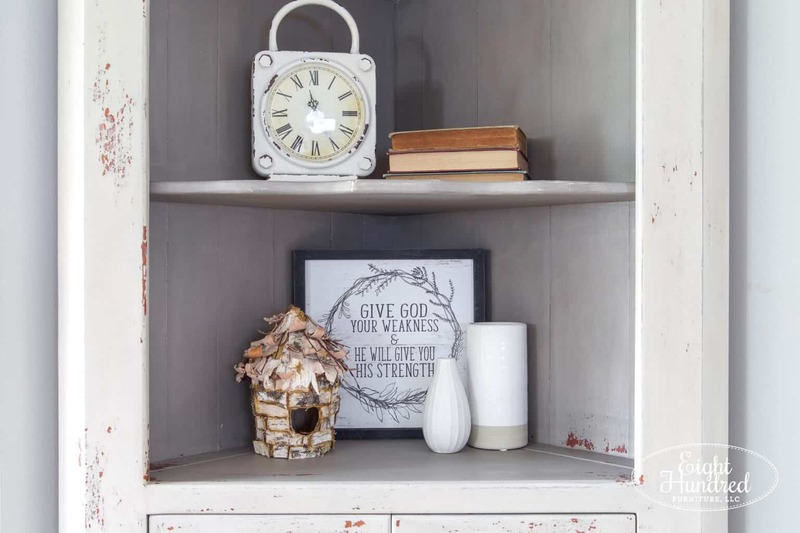 These colors perfectly complimented her wall paint, rug and other accents in the room the corner cupboard went in. As I added more layers of paint, the chipping continued. You can see it on the corner cupboard doors below. To add age, I applied a layer of Hemp Oil to seal the piece and topped it with Antiquing Wax. If you want a full tutorial on how to do this, you can read my post here. Throughout the painting process, I stayed in touch with my customer through text. I checked in with her to show her the different stages. This ensured that there would be no surprises when the piece was finished. Even though I encountered unexpected chipping, we both worked together to evaluate whether the look would be suitable to her taste and her decor. In the end, everything worked out quite beautifully! 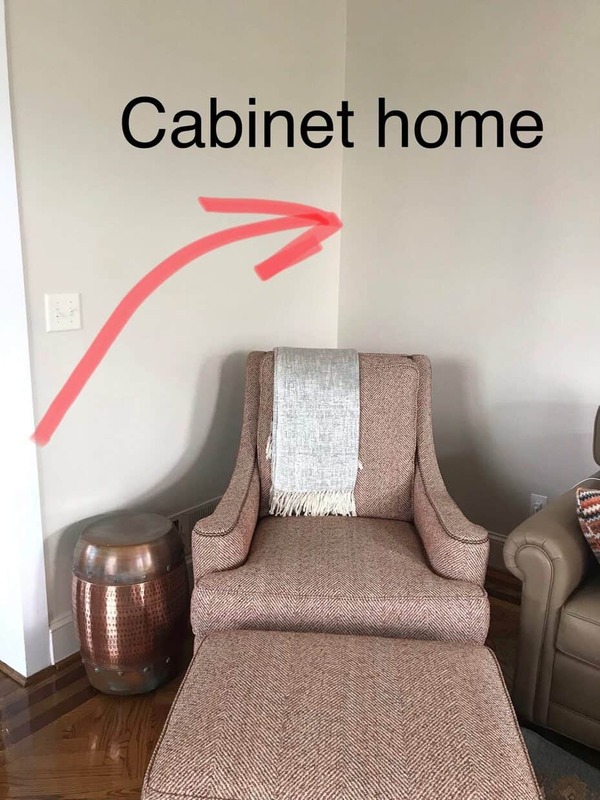 This cabinet now looks like it’s over 100 years ago. 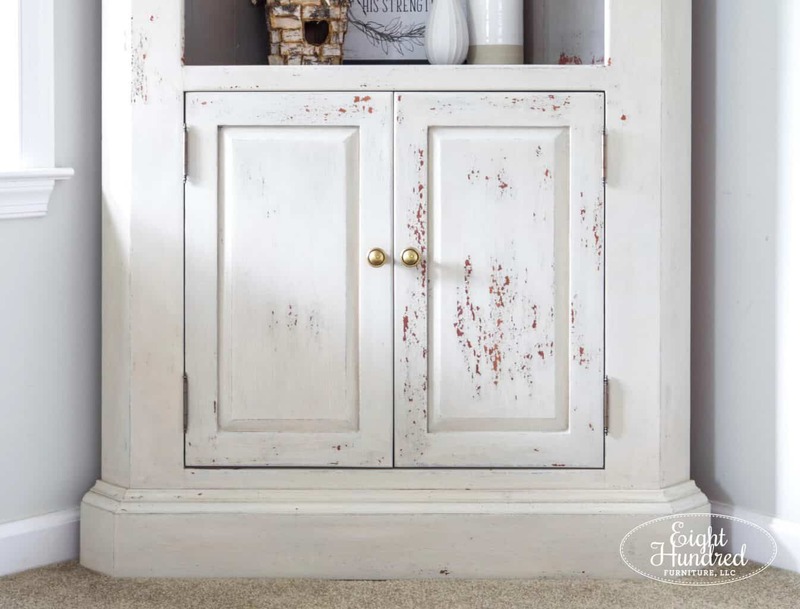 It could have come out of an old farmhouse or have been built into an old kitchen and you would never know the difference. The warmth of the Marzipan and Schloss play so well together! 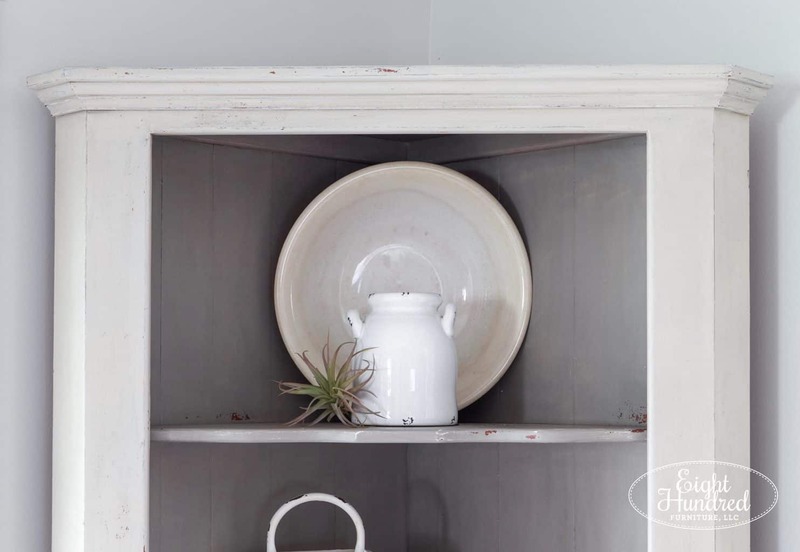 As I staged her corner cupboard, I picked a mixture of old and new pieces. 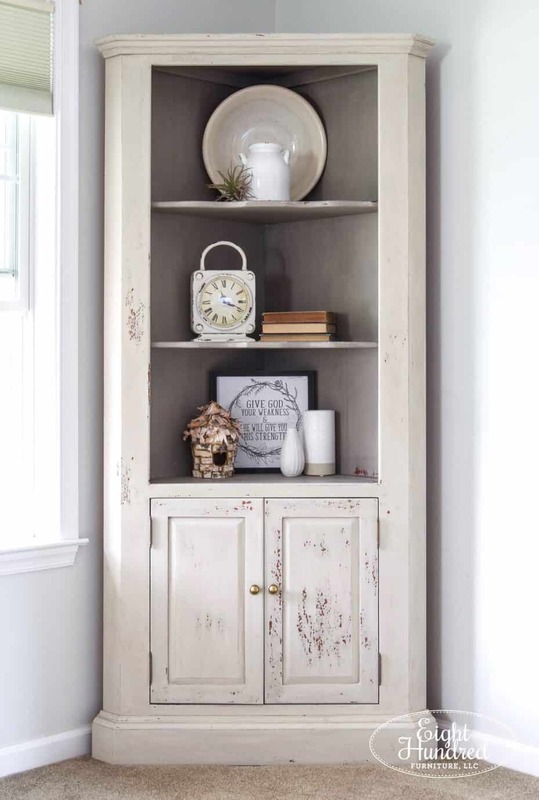 I wanted different tones of whites and creams nestled with varying textures like old book pages and curly bark pieces. The texture that was created from all of the layers is absolutely beautiful! It looks like it happened over the span of decades instead of hours. I think the doors are probably my favorite. They chipped randomly and unevenly, but that’s very similar to how things wear naturally over time. Weathering is rarely symmetrical. At a whopping 7 feet tall, this corner cupboard stayed upstairs while I worked on it over the course of the past few weeks. It’s quite a solid piece that now fits in with the decor surrounding it. It’s going to be back in its spot behind my customer’s chair soon. Until then, I’m going to enjoy it for a little while longer in our family room! Now that this piece is finished, I’m going to hit the “pause” button on custom work for a good while. I’ve got a super busy April with furniture painting demonstrations and a Spring Open House at Homestead Studios. In May, I’m scheduled to be at an indoor antique market event in Lebanon, PA during Mother’s Day weekend. To catch up on where I’ll be and when, you can visit my upcoming events page! From here on out, it’s full steam ahead on blowing through my slightly embarrassing pile of project pieces down in the workshop. Cheers to more great projects to come! This piece is fabulous. 😍 Your work has really been elevated lately! It’s always been really good but lately there is just another level. 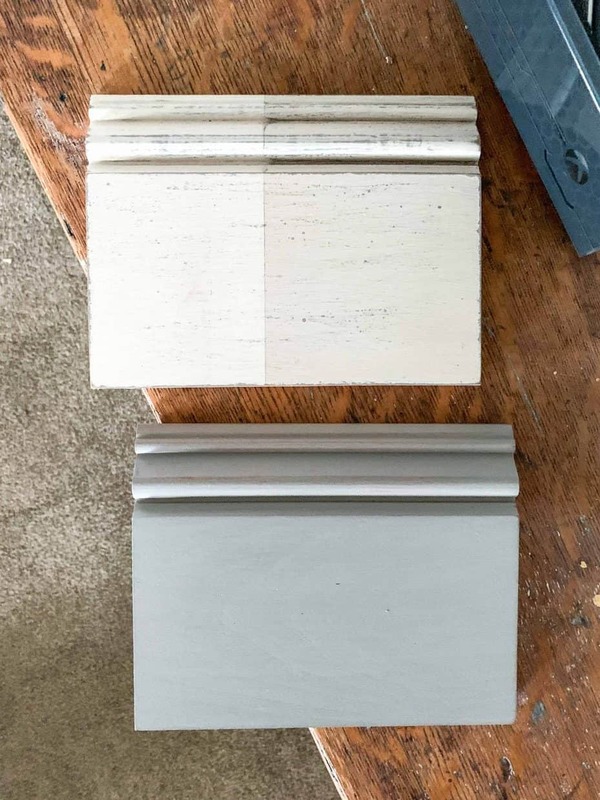 I TOTALLY agree with your assessment about sanding. I always sand even if just lightly. Love and admire your detailed post too. Thank you for all the work you put into your blog posts. I KNOW it takes so much time and thought. Oh my goodness! What sweet words, Anna! Thank you so much for writing to me. And yes, prep work is so important!